What is the PFSA REDS travel level? 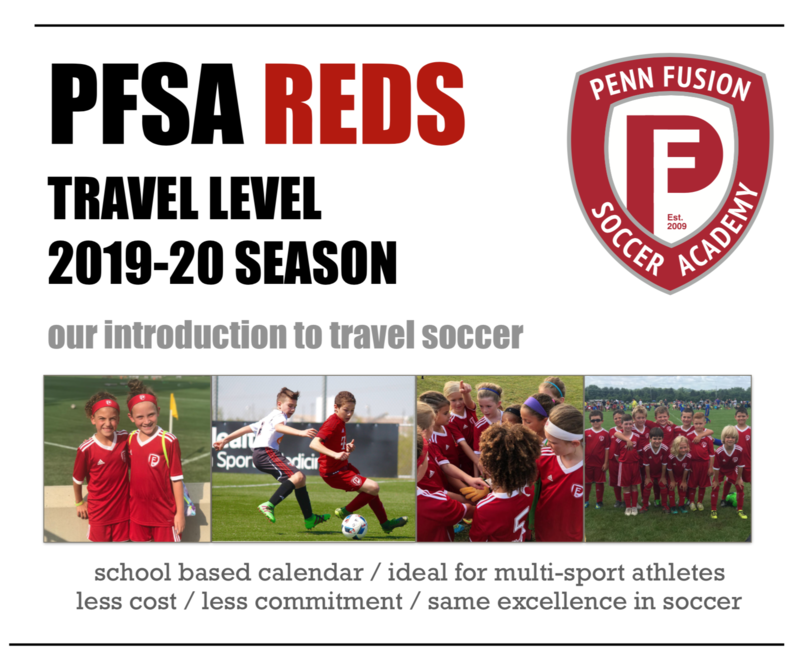 The goal of the PFSA 'REDS' travel level is to provide an elite soccer environment with a more flexible schedule, reducing long distance travel, and allowing multi-sport athletes to continue to develop within our Academy at the U9 and U10 Boys and Girls age groups. Who can participate in Travel Lite? All players regardless of club affiliation can tryout for the 'REDS' travel level. The relaxed schedule is ideal for multi-sport athletes. How do I register my child for the 'REDS' travel level tryout? Please complete the 'REDS' travel level player form and a staff member will reach out to your shortly with more informaiton on tryouts and registration. What is the commitment level to be a 'REDS' travel player? June: following tyrouts attend 4 optional training sessions. July & August: OFF - NO TEAM EVENTS. team starts up after labor day. 1 fall tournament (Columbus weekend). season ends the week of Thanksgiving. December & January: OFF - NO TEAM EVENTS. Winter Futsal Training & League (1 weekly event). season ends the week prior to Memorial weekend. What is the cost to be a 'REDS' travel player? What is not covered in the fee? travel to and from games/events is the responsibility of parents. referee fees for league games. Who coaches within the REDS travel level? All 'REDS' teams will be assigned a PFSA Head Staff Coach that will be present at all team events. All coaches are USSF, EPYSA, or USC licensed coaches and have all valid PA State clearances. Will PFSA still offer traditional travel at the U9 & U10 age groups? YES! PFSA will continue to offer traditional travel soccer in these age groups which run on a 10 month calendar and 3 events per week. The 'REDS' program is an optional new level for families/players that want more flexibility and less commitment.